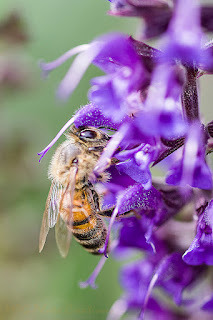 My image today is of a Honey Bee that was busily working on the Salvia in my garden. It didn't seem to care that I was there wit my camera and getting fairly close to it. Salvia is a great plant for Spring especially because it blooms early and provides food for the bees and butterflies that are around early.